Dad For Disney has reached single digits until his upcoming trip to Walt Disney World. Reaching single digits means the vacation is now close enough to start doing some serious trip planning and not of the Fastpass+ and ADR variety. Some actual, “THIS TRIP IS REALLY HAPPENING!” type of planning. Today, I’m going to go some of the things on my “last-minute checklist” to make sure that everything is good to go when that departure day actually comes. Flight times have a big impact on a vacation and airlines have been known to change flight times without or very little notice. It is important to check to see if your flight times have changed. For this trip, we checked our flight times a few weeks ago and noticed a HUGE change. The departure time for our flight to MCO had been moved up 30 minutes. No big deal. We just get to MCO and WDW sooner. The shock came on our return flight. The flight had moved up six hours!?!?! This completely our plans. My wife and I talked it over and we didn’t want to leave six hours early (we had important ADRs and Fastpass+ reservations that day). So, we talked with the airline and they booked on a flight the following morning with no change fee or fare difference charge. This leads me into another sub-tip: be proactive with the airlines. If something happens with your flight, don’t wait to hear from them what your options are. Give them options. Airlines when cancelling flights, unless it’s due to major weather concerns, take their time. Use this time to do some research. Find alternative flights even if they are on a different airline or a different airport. If you give them options, they are, usually, more accommodating and you will help you figure something out. Weather forecasting has improved greatly especially longer range forecasting. At around 10 days, the forecast isn’t set in stone but it can provide a range of what the forecast could be. Summer travelers: Don’t freak out when it says there is going to be a 100% chance of rain. These are mainly late afternoon thunderstorms. Hit the parks early and then return to the resort for some pool time while waiting for the storm to pass. Then hit the parks again in the evening. Accuweather – Accuweather has long-range forecasts that go 45 days but after 10-15 days the forecast is based more on local climatology than anything else. This time is the perfect time to start mentally packing and setting clothes aside that you want to take to Disney. Using the 10-day weather forecasts can actually help in the packing since you can see if you need to bring that sweatshirt or light jacket or even a heavier jacket if need be. This helps make the packing process go faster since you either have clothes already packed in the luggage or ready to be packed. The only end should be socks and undergarments since we need those on a daily basis. If you plan to take new shoes, now is the time to break them in. Breaking them in at Disney can be a very bad idea especially if when walking they cause blistering and/or sore feet. You don’t want to spend a lot of time on vacation at the First Aid getting treated for blisters. 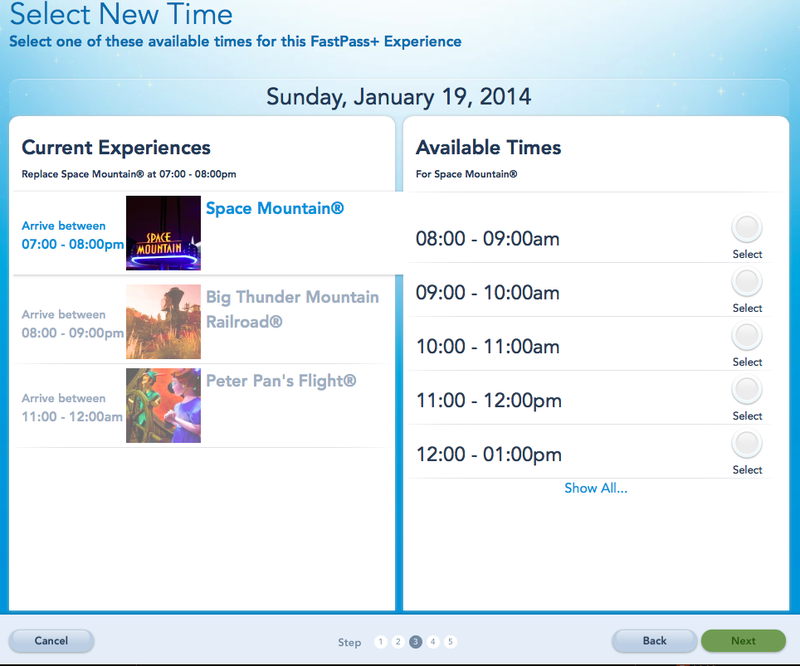 This is also a good time to look over your Fastpass+ and dining reservations one more time to see if they are any conflicts. It’s better to aware of the problem before you get to Walt Disney World. Basically, the longer lead time you have on the time conflict, you chances of resolving the conflict is greater. It’s no fun to find out on the day of the conflict that you have a FP+ at Toy Story Midway Mania from 4:10 to 5:10 pm and then you have an ADR at Be Our Guest at 4:45 pm. Unless you clone yourself, odds are you are not going to make both reservations. Like dealing with the airlines, be proactive. Attempt to solve the yourself before getting a Disney Cast Member involved. Don’t wait until the last-minute.